126min. Directed by Neil Burger. 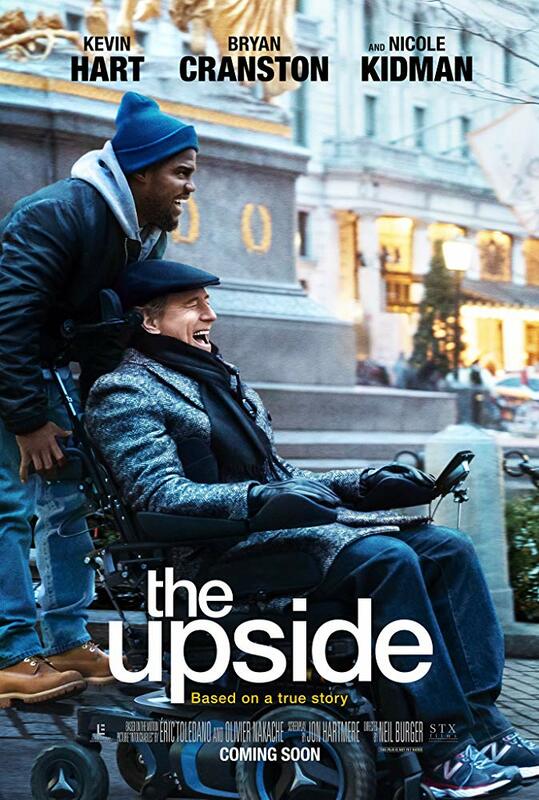 Based on a true story, THE UPSIDE chronicles the unexpected friendship between Phillip Lacasse (Bryan Cranston), a Park Avenue billionaire left paralyzed after a hang-gliding accident, and ex-con Dell Scott (Kevin Hart), in need of a job and a fresh start. From worlds apart, Phillip and Dell form an unlikely bond, bridging their differences and gaining invaluable wisdom in the process, giving each man a renewed sense of passion for all of life’s possibilities. Directed by Neil Burger (The Illusionist, Limitless) and written by Jon Hartmere, THE UPSIDE also stars Academy Award® winner Nicole Kidman.